This article is about the Greek letter Gamma Γ (and γ) as used in various fields. For the Latin forms like Ɣ see Gamma § Phonetic transcription. For other uses, see Gamma (disambiguation). Gamma (uppercase Γ, lowercase γ; Greek: γάμμα gámma) is the third letter of the Greek alphabet. In the system of Greek numerals it has a value of 3. In Ancient Greek, the letter gamma represented a voiced velar stop /ɡ/. In Modern Greek, this letter represents either a voiced velar fricative or a voiced palatal fricative. In the International Phonetic Alphabet and other modern Latin-alphabet based phonetic notations, it represents the voiced velar fricative. The Greek letter Gamma Γ was derived from the Phoenician letter for the /g/ phoneme (𐤂 gīml), and as such is cognate with Hebrew gimel ג. Based on its name, the letter has been interpreted as an abstract representation of a camel's neck, but this has been criticized as contrived, and it is more likely that the letter is derived from an Egyptian hieroglyph representing a club or throwing stick. In Archaic Greece, the shape of gamma was closer to a classical lambda (Λ), while lambda retained the Phoenician L-shape (𐌋). Letters that arose from the Greek gamma include Etruscan (Old Italic) 𐌂, Roman C and G, Runic kaunan ᚲ, Gothic geuua 𐌲, the Coptic Ⲅ, and the Cyrillic letters Г and Ґ. The Ancient Greek /g/ phoneme was the voiced velar stop, continuing the reconstructed proto-Indo-European *g, *ǵ. The modern Greek phoneme represented by gamma is realized either as a voiced palatal fricative (/ʝ/) before a front vowel (/e/, /i/), or as a voiced velar fricative /ɣ/ in all other environments. Both in Ancient and in Modern Greek, before other velar consonants (κ, χ, ξ k, kh, ks), gamma represents a velar nasal /ŋ/. A double gamma γγ represents the sequence /ŋɡ/ (phonetically varying [ŋɡ~ɡ]) or /ŋɣ/. 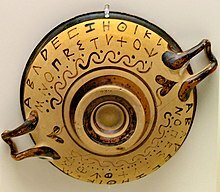 The gamma was added to the Latin alphabet, in the following forms: majuscule Ɣ, minuscule ɣ, and superscript modifier letter ˠ.
Lowercase Greek gamma is used in the Americanist phonetic notation and Uralic Phonetic Alphabet to indicate voiced consonants. In International Phonetic Alphabet, it represents the voiced velar fricative. In the International Phonetic Alphabet the minuscule letter is used to represent a voiced velar fricative and the superscript modifier letter is used to represent velarization. It is not to be confused with the character ɤ, which looks like a lowercase Latin gamma that lies above the baseline rather than crossing, and which represents the close-mid back unrounded vowel. In certain nonstandard variations of the IPA, the uppercase form is used. It is as a full-fledged majuscule and minuscule letter in the alphabets of some of languages of Africa such as Dagbani, Dinka, Kabye, and Ewe, and Berber languages using the Berber Latin alphabet. It is sometimes also used in the romanization of Pashto. A non-SI metric unit of measure of mass equal to one microgram (1 μg). This always-rare use is currently deprecated. A non-SI unit of measure of magnetic flux density, sometimes used in geophysics, equal to 1 nanotesla (nT). Austenite (also known as γ-iron), a metallic non-magnetic allotrope or solid solution of iron. The lowercase Latin gamma ɣ can also be used in contexts (such as chemical or molecule nomenclature) where gamma must not be confused with the letter y, which can occur in some computer typefaces. In probability theory and statistics, the gamma distribution is a two-parameter family of continuous probability distributions. The HTML entities for uppercase and lowercase gamma are &Gamma; and &gamma;. Look up Γ or γ in Wiktionary, the free dictionary. Look up Ɣ or ɣ in Wiktionary, the free dictionary. ^ Russell, Bertrand (1972). A history of western philosophy (60th print. ed.). New York: Touchstone book. ISBN 9780671314002. ^ Powell, Barry B. (2012). Writing: Theory and History of the Technology of Civilization. John Wiley & Sons. p. 182. ISBN 978-1-118-29349-2. ^ Hamilton, Gordon James (2006). The Origins of the West Semitic Alphabet in Egyptian Scripts. Catholic Biblical Association of America. pp. 53–6. ISBN 978-0-915170-40-1. ^ "Greek Alphabet Symbols". Rapid Tables. Retrieved 25 August 2014. ^ François Cardarelli (2003). Encyclopaedia of Scientific Units, Weights and Measures. Springer-Verlag London Ltd. ISBN 978-1-4471-1122-1.